Departing from the realisation that the work of Singapore artists is often overlooked, suffering both from a general lack of self-confidence emanating from the local art scene and the sweeping statements made about the authoritarianism of their state by outsiders, this issue of Pipeline aims to show some of their practices together, rather simply in the form of a special issue. This issue proposes an introduction to a place that is, despite its flaws, thriving with more artists than one would think. As it is often the case, these artists are multidisciplinary. They are eager to work in a variety of media and juggle concepts while remaining humbly flexible because even when they participate in internationally renowned exhibitions, they are outside the art system. While we only symbolically mention the conceptual heritage of Cheo Chai Hiang, for those in need of an overview on the recent developments in the art scene, Bharti Lalvani writes about The Artists Village and the seminal performances that became references in the contemporary Singaporean art scene. To begin to understand what preoccupies artists from the younger generation, we asked them: Benjamin Ziggy Lee, Jacquelyn Soo, Shah Rizzal, Mathew Teo, Mintio, Natasha Wei and Nur Azam Ismail all talk about their practices, spanning from performance to photography to kinetic art to graffiti, and what it means for them to be an artist in Singapore. Ho Tzu Nyen beautifully writes about his practice and muses, and shares a personal list of works that influenced him in making his theatrical pieces. Charles Lim, the artist who is known to explore the sea in more ways than one, explains how he came to map its territory, while Heman Chong came up with some playful and some serious answers about possible futures, literature and the state of things. Song-Ming An created an inspired text based on his recent observations of local bird-singing competitions; when asked about something Singapore, this is what was close to his creative influences. And on the Back Page, Wee Li Lin offers a list of movies and shorts one should watch to discover more about the spirited, polyglot local crowd. We also benefited from artists’ Jane Lee, Ling-Nah Tang and Michael Lee‘s insights and contributed works. Also in this issue, Yuk King Tan gets further into her investigation of the Mormons in Hong Kong with the Spine project; Caroline Ha Thuc reviews two exhibitions in Hong Kong by two curators from Singapore (Eugene Tan at the Hong Kong Art Center and Qinyi Lim at Para/Site); Cesar Reyes goes deep into the many layers of the Taipei Biennale in his review; and we make a special mention of the great retrospective of Santiago Bose‘s works at the Manila’s Vargas Museum. 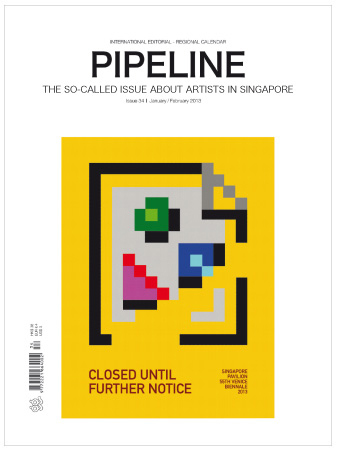 Pipeline is an independent magazine of contemporary art based in Hong Kong with an international editorial and a regional calendar of galleries’ events. The publication’s contents are accessible and yet eclectic, making it a practical resource for collectors (calendars, maps, directories of galleries in Hong Kong, Taiwan, China, Singapore etc. ); a brainstorming platform for curators, keeping an open mind and offering room for dialogue; and a playground for artists in exercising experimental initiatives and linking different practices around a theme. Pipeline is published 6 times a year. Subscribe to the print version on www.pipelinemag.com. Subscribe to the digital version on Magzter.